This is another traditional south indian curry (poriyal), with some extra spices and termed as 'thuvattal'. A Tanjore style curry made by tambrams. 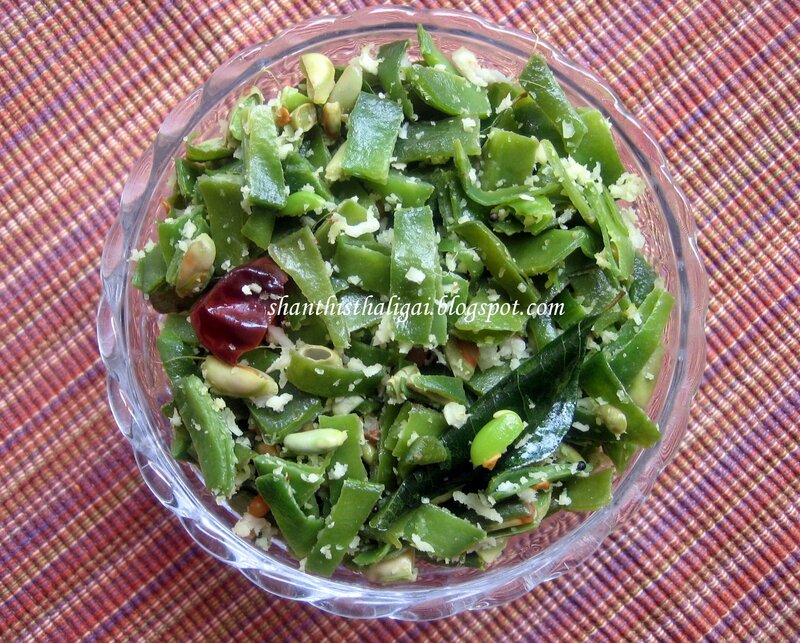 This can be done with any country veggies like broad beans, snakegourd, cluster beans, vazhaipoo (plantain flower) etc. Avaraikkai (Broadbeans) - 1/2 kg. Wash and chop the avaraikai finely. In a pan, dry roast toor dhal, chilli and cumin seeds in order until golden brown. When cool powder it. Keep aside. In the same pan, heat oil and when hot add mustard, urad dhal and chillies. When golden brown, add hing, turmeric powder and curry leaves. Saute quickly and add the chopped avaraikkai, salt, mix well and sprinkle very little water. Cover with a lid and cook on low flame until the veggies are cooked and soft. Finally, add the ground powder, grated coconut, mix well and saute for a minute. Serve as a curry with south indian thali. VARIATION: Cooked moong dhal (should be soft and cooked like sundal but not mushy) can be added. A frequent side dish in my house and my favourite. This is a new dish to me... Looks super yummy.. Will try soon.